Update: Congratulations to our winner, Melissa Faulkner! Today's giveaway is a selection of souvenirs from The Wizarding World of Harry Potter, plus our two new "Theme Park Insider Visits" guidebooks. 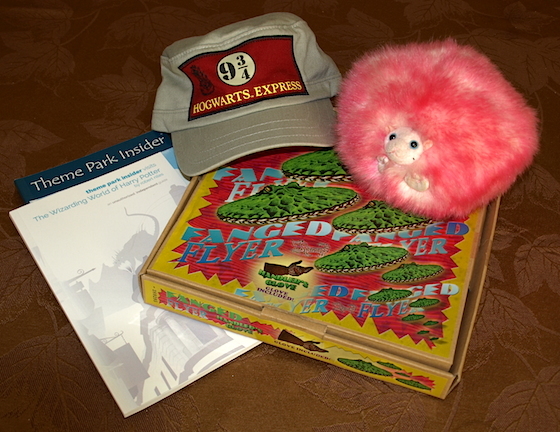 The prize pack includes a Fanged Flyer, Pygmy Puff, Hogwarts Express cap, and signed copies of Theme Park Insider Visits The Wizarding World of Harry Potter and Theme Park Insider Visits Walt Disney World and Universal Orlando (2015), which is going on sale next week. To enter today's giveaway you need to do two things: First, you will have to reply to the thread, as we did for the past two giveaways. In addition, you will need to have submitted at least one attraction, restaurant, or hotel review to the website between the time I post this thread and the giveaway deadline. You can submit attraction and restaurant ratings via our Park Guides page, and hotel ratings via our Hotel Reviews page. I will pick the winner by selecting one eligible entry at random at the deadline. (I will contact the winner via your email address in your registration profile. If the winner does not respond to me within 48 hours, I will disqualify that winner and pick another one, until I get someone who does respond.) Once we have a winner, I will post that to this page. The deadline for this giveaway is 9pm PT on Thursday, Oct. 29 30. Good luck! My daughter would love to have the Harry Potter prize pack! Thanks for the great prizes! Please put me into the drawing! Thank you, Robert! Remember, you must have an uploaded profile photo to be eligible. See yesterday's giveaway for instructions on how to do that. Oh, yes. Harry Potter is my fave! If I could I would live at the Leaky Cauldron. Hoping to win the goody bag today. Photo has been updated, I'm wearing my Mickey planet shirt. so pick me! I've always wanted a pygmy puff!! Hi, I'm here for the Harry Potter prize pack! I'm such a huge Harry Potter fan! I am having so much fun entering each of the contests! I am really going to start using the Website much more now! It is sort of like a tour of the features of the website, with a prize dangled as incentive. Thanks Robert! Yet another awesome prize... This would be great for a huge Potter fan like myself! Cool prize! My daughter is a huge HP fan! I'd enjoy this little goody bag, myself. Thanks, Robert! nice to win, Thanks Robert you are the best!!! I'm a huge HP and Universal fan, and being a teacher, I'm really bummed I can only go on holidays and over summer when its usually packed. Would love to be able to go in January or November. Would love this prize. I wrote a little review on Hollywood and Vine. Will put in a review of the Festival of the Lion King at Disney's Animal Kingdom. Yes please! That pygmy puff is way too cute! Great idea to boost reviews! Very interested in the books. Thanks for running the giveaway. Would love to win this for my fiancée. She's the biggest Harry Potter fan ever! Just wrote a review for Gran Fiesta Tour at Epcot. It was mainly to enter this giveaway, but I'm now thinking about writing some more reviews over the coming days. I've already rated every ride I've been on in the last year. Perhaps I should transfer some of the reviews over from my trip report. After all, they're already written. Great idea to get some more review activity going! I like that you are doing all these giveaways to improve the already great community here. Here's to hoping I win! Thanks for these great prizes. I reviewed the WDW gem, PhilharMagic...loved it. I reviewed Disney's Old Key West Resort. Love the site! And love Harry Potter!! Just reviewed the first roller coaster my 7 year old daughter rode on. It was the Barnstormer. Reviewed Disnneyland Hotel. Thanks for sparking the memories! This is a lot of fun Robert! Keep it coming. Thanks Robert. I love Harry Potter!! Good assortment, I've got just the head for that hat. OK. Contest is closed now. I've emailed the winner and will post the name once s/he has responded. Congratulations to our winner, Melissa Faulkner!